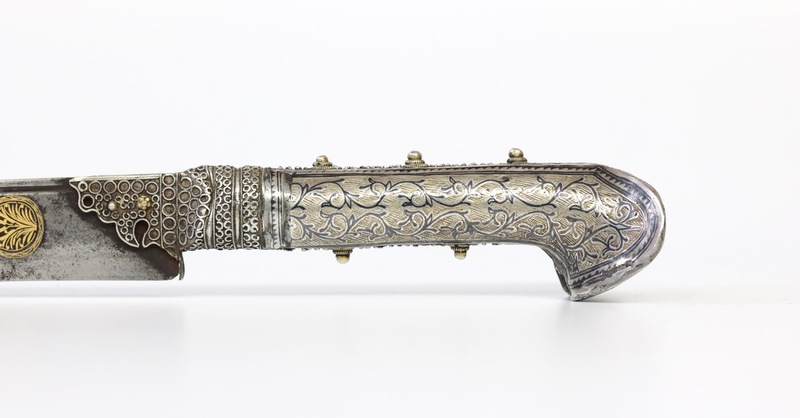 An Ottoman bichaq , literally "knife", shaped like a yatağan , the sword carried by military men (infrantry) and wealthy civilians in the Ottoman empire. 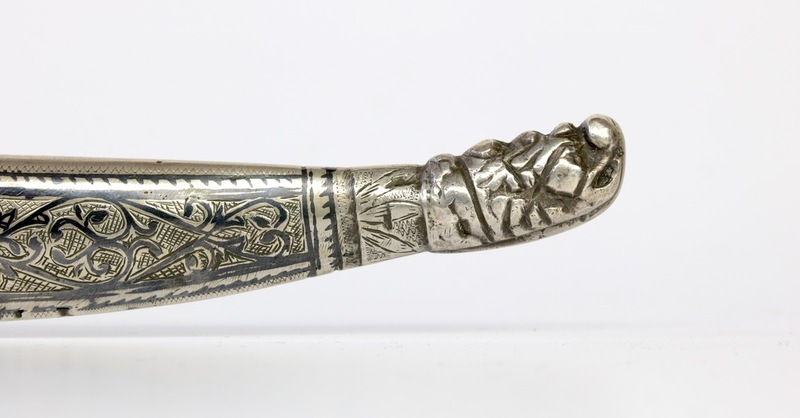 The straight blade on this example with subtly upswept tip shows signs of forge folded construction. 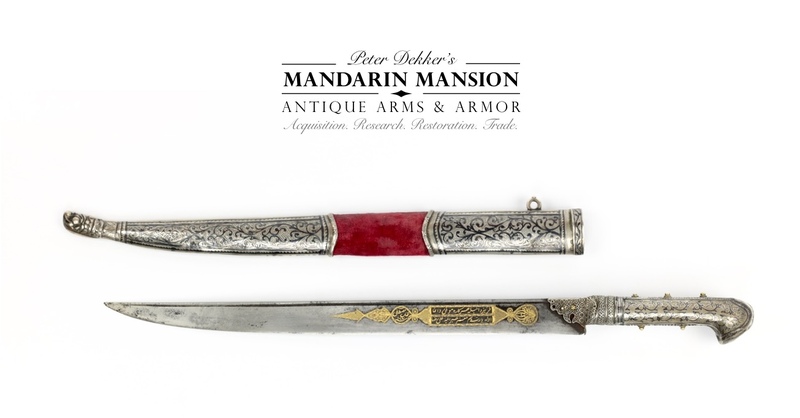 It is of very good workmanship, with precise geometry and fine details like grooves on the back of the blade. 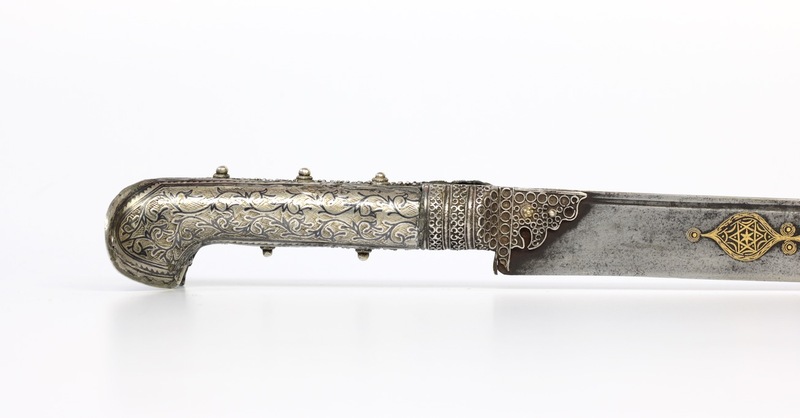 Blade with golden damascening on both sides, the work is exceptionally well-done in the style of fine Ottoman calligraphy, an art that stood in the highest esteem. The right side with geometric designs and Solomon's Seal. The left side elaborately damascened with cartouches containing a marker's mark (Mustafa) and a poem for the intended owner, Ali Riza. Maker's mark: "amel-i mustafa, sana 1290"
Poem: "Yezdân ile her kere muvaffaq dâimâ - ola yâ Rabb hem muammer hayr ile Ali Rızâ"
Possible translation: "With the Holy Light, always successful in every endeavour - O God, May Ali Rıza have a good (and long) life"
Ali Riza was a common name, then and now, so there is no telling who it belonged to. A famous Ali Riza -who lived in the Balkans- was Ali Riza Efendi, father of Mustafa Kemal Atatürk, founder of the Republic of Turkey. 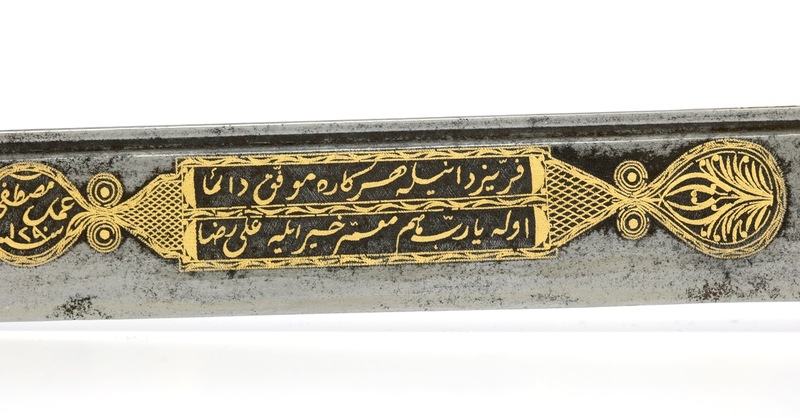 This Ali Riza would have been 34 years old when the knife was made. Wishful thinking! 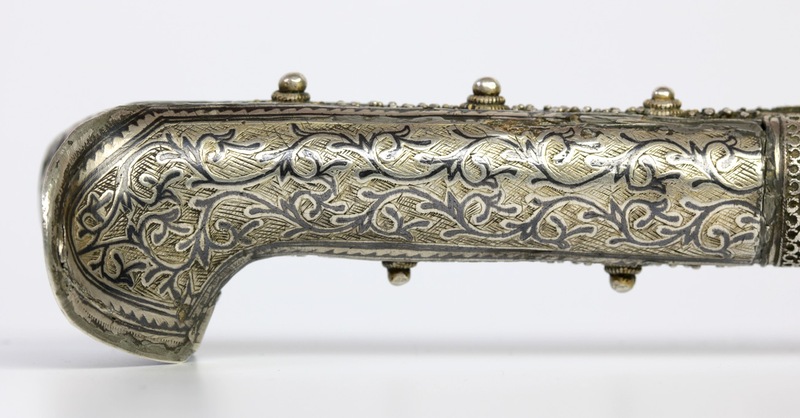 The characteristic "eared" handle is entirely of silver, parts decorated with fine filigree and smooth plated with decoration in engraving and dark blue niello inlays of vine motifs, contrasting nicely with the silver. There is a dent at the front left of the handle. 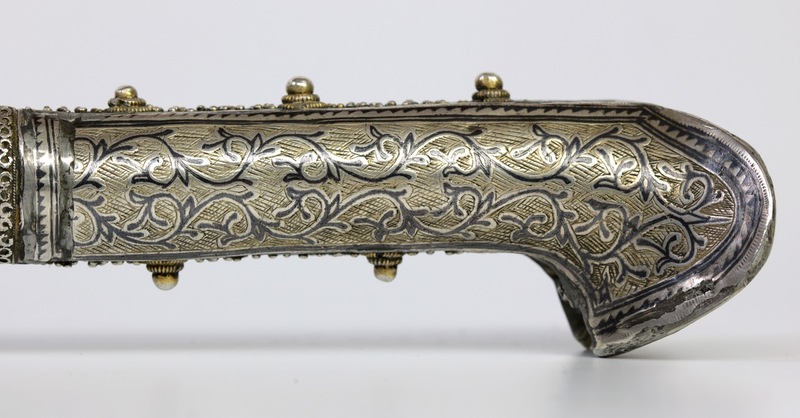 The back plate of the right "ear" of the handle is a later replacement in a similar style and medium. 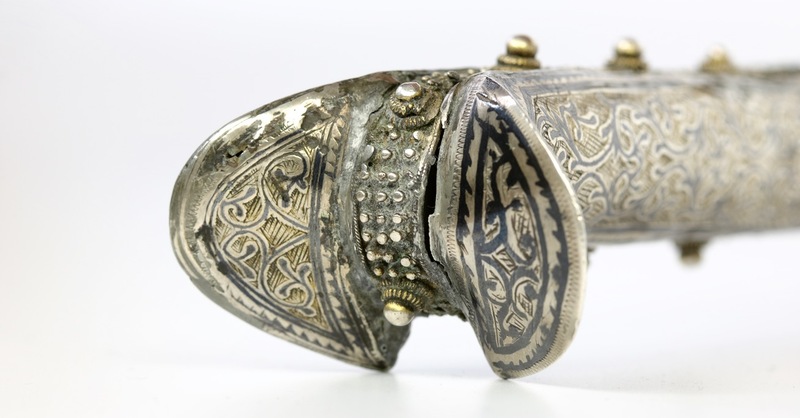 It corresponds with the scabbard fittings suggesting that whoever fixed the pommel also made the scabbard. These all seem old, working-life replacements. 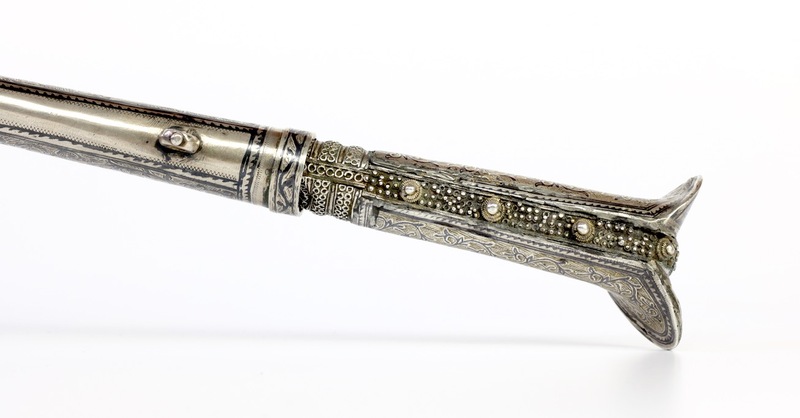 The wooden scabbard with long silver throatpiece and endpiece, engraved and inlaid with decor of vines in niello. The piece between the two fittings is covered with red velvet. 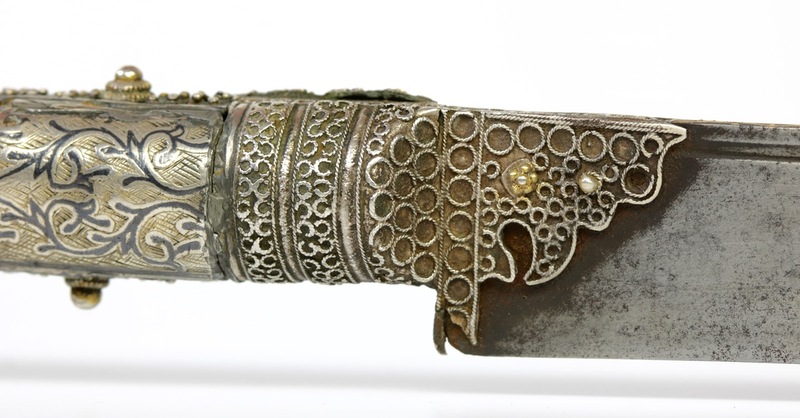 At the end of the scabbard is a dragon head finial. 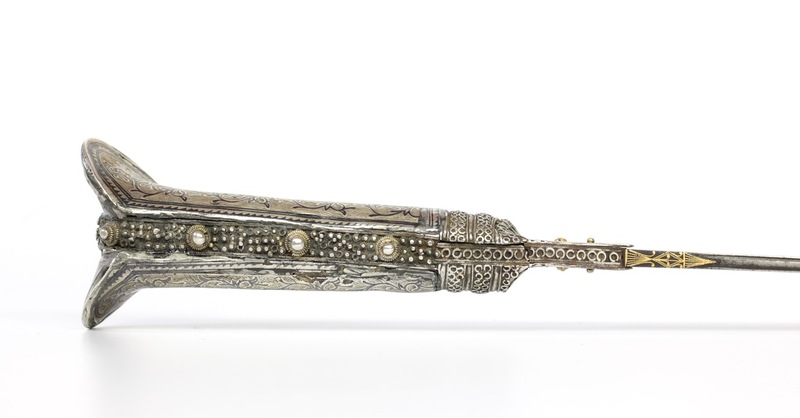 A fine Ottoman knife, probably from the Balkan region, with elegant straight blade and silver niello mounts. 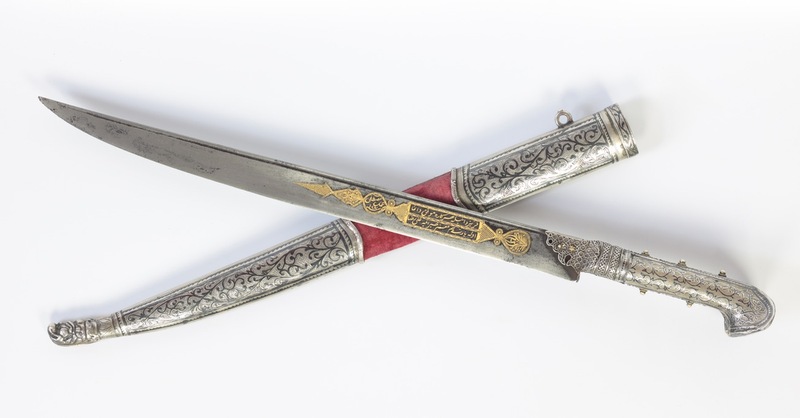 Its blade signed with the maker and owner's name in fine Ottoman calligraphy, damascened in gold.